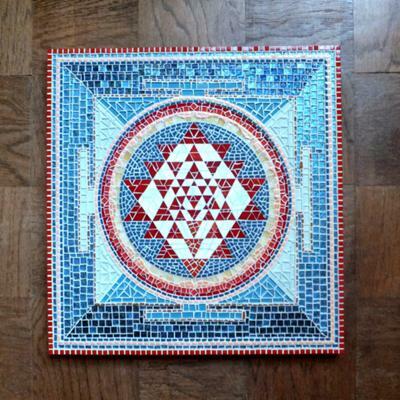 I had finished a smaller mandal 10x10” and was telling someone about it when they asked me if I could do a Sri Yantra. I said "Sure". I was feeling good, like "I can mosaic anything" good! So I went home and looked up Sri Yantra. Oh my, talk about complex! It took me almost the same amount of time to tile it as it did to figure out how to draw it! I used ceramic, stained glass, vitreous glass, carnelian stone beads and Van Gogh glass. It measures 24x24.